The U.S. Supreme Court agreed today to take up a case that could deal a crippling blow to unions representing millions of the nation's public employees. The justices will decide whether state government workers who choose not to join a union must still pay a share of union dues (agency fees) to cover the cost of negotiating contracts. At stake is the future power and financial health of public sector unions in the 22 states where they have a duty to bargain for both members and nonmembers alike. Although there is now a statewide contract in place this year, members of the AFT Local 1904 continue to assert our solidarity as a union by participating in our weekly Solidarity Walks across campus, each Wednesday during the semester (starting at 12:30pm, leaving from Cafe Diem). 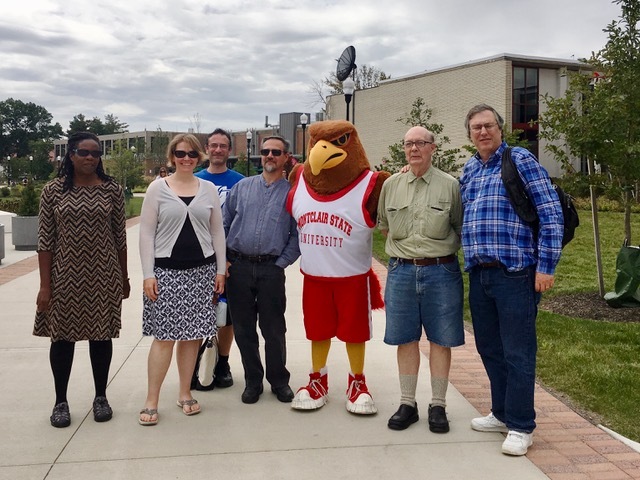 Last Wednesday, our group encountered Rocky the Redhawk, who was kind enough to pose with us for a group photo! Organized labor continues to face numerous challenges, and remains under attack on various levels, throughout the nation. It remains important to continue our momentum as a Local, and to continue building our membership. Please join us for our Solidarity Walks, and/or remain active as a part of our bargaining unit in any other ways that your time and inclination allows. The AFT Local 1904 Office is Moving! The AFT Local 1904 Office is relocating to Dickson 104. The office will close as of Wednesday, September 27th of September, and will reopen at the new location on Tuesday, October 3rd. From September 27th through October 2nd, please call the office to leave a voice message only in the event of an emergency, or leave an email message at union@aftlocal1904.org. Alternatively, you can contact President Rich Wolfson, via email, at rich.wolfson@aftlocal1904.org. Please note: At the new location, there will be NEW office hours on Tuesdays and Thursdays: 9:00am-2:30pm.